Late Saturday evening, I had a meltdown when I found the deep freeze had decided to have its own meltdown. Fortunately, we didn't lose very much food and did have another freezer to transfer food into. Part of my meltdown remedy was spent in the kitchen this afternoon cooking an assortment of meat that had thawed but was still safe to cook. Since it's going to be a busy week, I decided to try a ground beef recipe that could be prepared ahead and frozen. 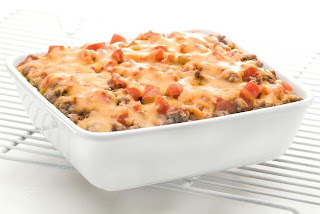 Preheat oven to 350 degrees F. Spray an 8x8-inch baking pan with nonstick cooking spray; set aside. In large skillet over medium heat, cook ground beef and onion until beef is brown and onion is soft; drain. Cook macaroni according to package directions;drain. Spoon macaroni into prepared pan. Spread beef mixture and chopped tomato over macaroni. Pour tomato sauce over beef. Sprinkle with seasoned salt,pepper and shredded cheese. Cover loosley with foil and bake for 35 minutes or until cheese is melted and edges of casserole are bubbling.